A lot of folks have a version of chronic fatigue syndrome when the topic of budget deficits comes up. After all, wasn't there a big spat over budget deficits through most of the 1980s and into the 1990s? And wasn't there a big spat over deficits through the middle years of the George W. Bush presidency in the mid-2000s? Every time you turn around the last few years, it feels like the federal government is about to the official "debt ceiling" and there's yet another round of breathless high stakes negotiating that pushes the problem back until after the next election, when we get to do it all again. Thus, it's important to understand that America's current trajectory of deficits and debt is not just one more round of political games. Instead, we have entered a situation where deficits and debt are already well outside usual parameters. What's often hard to explain is that the U.S. deficit and debt problem isn't (yet) an emergency situation that is likely to rock the U.S. economy in the next year or two or three. There's still some time for adjustments. But we really don't want to waste that time. 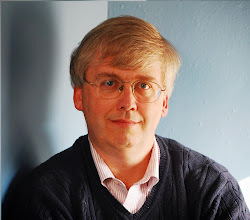 Daniel Thornton offers useful overview and insights in "The U.S. Deficit/Debt Problem:A Longer-Run Perspective," in the November/December 2012 issue of the Review published by the Federal Reserve Bank of St. Louis. For another perspective, here's the ratio of accumulated gross government debt/GDP. The main episodes of high budget deficits are visible here as upward bumps in the ratio. The debt/GDP ratio is approaching levels that have only been broached by the funds borrowed to fight World War II. 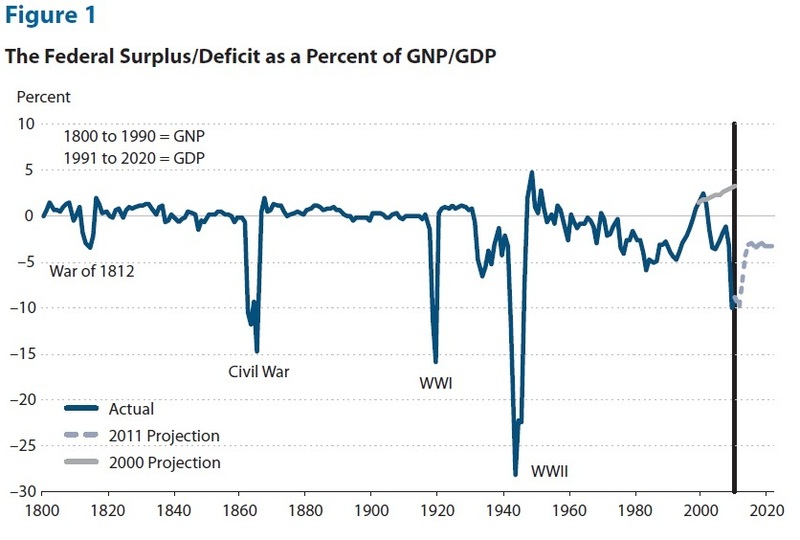 Thornton emphasizes that the roots of our current deficit and debt troubles go back well before the Great Recession of 2007-2009, and well before Bush tax cuts earlier in the 2000. Instead, Thornton locates the start of the problems back to about 1970. 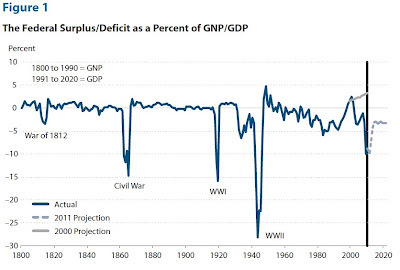 In the chart of annual deficits, for example, notice that after about 1970 a pattern of volatile but growing deficits emerges. The pattern is interrupted for a few years in the late 1990s by the higher tax revenues and lower social spending resulting from the unsustainable dot-com boom, but a return to the larger deficits was coming eventually. Similarly, the debt/GDP chart shows that ratio bottoming out around the mid-1970s, and then beginning to climb--again with a bump for the dot-com years of the late 1990s. What factor has been driving spending higher? Thornton's answer is straightforward: "[M]ost of the increase in spending that generated the persistent deficit over the 38 years before the financial crisis was spending for Medicare and Medicaid, particularly Medicare." My own take is that it's been clear since at least the 1980s, and arguably earlier, that the U.S. budget was going to run into severe difficulties when the baby boom generation started retiring. The leading edge of the boomer generation was born in 1946, and thus is just now hitting age 65 and heading into retirement in substantial numbers. This demographic shift was going to cause problems for Social Security, but those problems could be dealt with by phasing back the retirement age and tweaking formulas for payments and benefits. In comparison, there is no easy way of addressing the combination of an aging American and steadily rising health care costs. In other words, a fiscal crisis has been coming for the U.S. budget for some decades. But before the Great Recession, we thought we had 20 years or so to make adjustments before we hit the danger zone. When the Great Recession squashed tax revenues and the attempt at fiscal stimulus pushed up spending, much of that lead time evaporated. 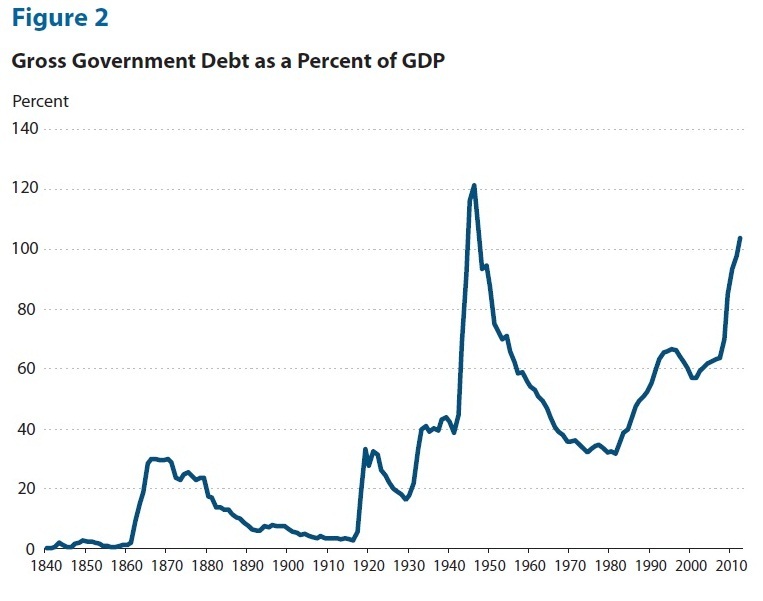 The Congressional Budget Office focuses on a somewhat different number than Thornton does, looking at debt "held by the public" rather than "gross" debt--essentially leaving out debt that the federal government owes to itself, like Treasury bonds held in the Social Security trust fund. By that measure, back in December 2007 before the Great Recession hit, long-term budget projections from CBO were that the debt/GDP ratio would rise to the danger zone of 100% by around 2030. Eighteen months later, after the Great Recession hit, the June 2009 report from the CBO forecast that the debt/GDP ratio would hit 100% around 2022. Of course, it would have been far more sensible to address these issues of high and rising health care costs and the looming problems of large fiscal deficits back before a Great Recession hit, but it wasn't politically possible to do so. So now we get to face these problems, decades in the making, in a weak economy and with a shortened timeline.